The last remaining drops of yield are being wrung out of the global government bond market while bears run amok. Although the adage "He who panics first, wins!" must be kept in mind, it is still not obvious whether or not this a re-run of previous summer silly seasons in financial markets. Since I am not able to give financial advice, I will keep these remarks brief. I just want to lay out how investors should weigh various risk scenarios, without suggesting what outcome to expect. It is clear that most people would prefer to read about what is going to happen in the future, but I believe that there is value in just trying to present clearly what is happening now. Although anyone whose porfolios are being torpedoed might not want to hear this, it is still unclear that anything is happening that cannot be cleared up by yet another wave of asset purchases by central banks. The Australian MMT academic Bill Mitchell has a good explanation of what is the main driver for the crisis -- the condition of Italian banks. As he notes, there are those who are trying to pin the blame for recent market turbulence on the U.K. "Brexit" vote. Seriously? If there are problems with Italian banks, they were the result of lending decisions entered into a long time ahead of the referendum vote. The weak economy in a euro peripheral country causes the banking system as well as government finances to implode, and exits rather than suffer the same fate as Greece. A core euro area member leaves the currency union for political reasons. Highly levered positions for global investors start to unravel, causing a liquidation chain such as we saw in 2008. The first two are obviously associated with the euro, but given the huge weight of European banks in derivative speculation, even #3 would likely result in the European banking system cratering. Although one could attempt to paint the weakness in risk assets as being the forerunner to at least one of these scenarios, we could also paint them as being the result of bears hitting thin summer markets. Until there are some sizeable defaults that force entities to take permanent writedowns on assets, paper losses remain purely notional for any entities (like banks) that are not extremely sensitive to mark-to-market effects. Massive purchases of risky assets by the ECB (for example) can easily turn the tables on anyone whose investment thesis relies solely upon mark-to-market stampeding. Unfortunately, propping up the prices of liquid assets only helps the liquidity management position of banks. It is not enough to deal with balance sheet losses on illiquid loan portfolios. I admit that I know almost nothing about the details of peripheral banking system loan books, but standard top-down analysis tells me that they cannot look too pretty if nominal income continues to be ground down by incompetent policy. Unless there is a growth miracle elsewhere that is big enough to drag along Europe, or there is a miraculous outbreak of common sense amongst European policymakers, all that we can expect is for the ECB to keep the mark-to-market effects stable enough that contagion is avoided. Zombie banking systems can limp along for decades, so there is no reason to assume that things have to be resolved this summer. Many market participants tend to place too much importance on short-term market-to-market swings. In other words, this is going to repeat every summer, just with new catalysts to explain the swoon in risk assets. 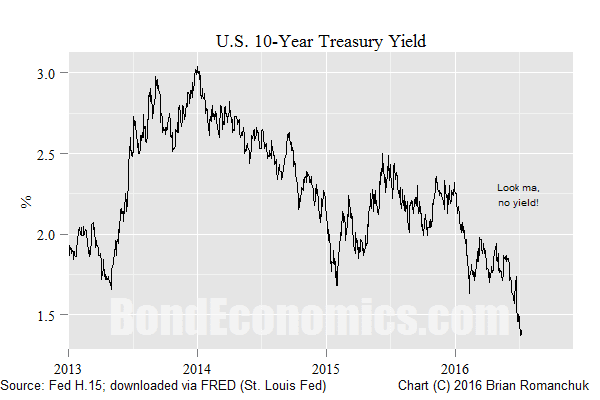 As shown in the chart at the top of this article, whatever yield that remained in the U.S. Treasury curve is disappearing. Although I am not bullish about the American and Canadian economies (particularly the Canadian), hopping in front of that freight train may not allow you to relax your mind so that you can enjoy some light summer reading. If the ECB does manage to stabilise the financial markets, the American economy is not in that bad a shape. If animal spirits revive, the hawks will start talking up the possibility of another December rate hike. However, they will probably be a short leash at least until after Labour Day. I had a long history of being a secular bond bull (or stopped clock, if you are a bond bear), but even I find this latest repricing somewhat puzzling. Brian, I think our framework for understanding this 'crisis' remains flawed. Just one example of flaw: Considering the euro zone, why is it better to have each euro member have it's own CB participating in a currency war rather than having just one euro-CB participating? It seems to me that the problem is a "currency war", not how may CBs are participating. With 'framework' as the focus of this comment, I will add that current macroeconomic thinking has a focus national production. This leads to national control of resources and one national price. Think potash fertilizer here for a moment. Only a few countries have the potash resource. There is currently competition between countries for potash customers and the recent purchases by India of potash in large blocks at 10 year low prices is an example of what is happening. National governments and their policies have a heavy influence on where the resource flows and at what prices. Of course, national policies also include factors such as the effects of newly printed money (debt issued with no intent to repay or reduce). The macro-framework we use for discussion matters. We need an improved macro-framework. The fact that each euro member has its own central bank is a key flaw in the system. Although it appears to be a single currency area, it is still just a fixed exchange rate scheme that can be attacked. But yes, analysis frameworks need to be improved. I suppose that the national CBs are constrained by treaty from creating money like private banks do. Otherwise they might be part of the solution, right? The Pennsylvania colony created money by lending directly to its citizens. That might be more politically palatable than borrowing and spending. The "ECB" is really just the union of the national central banks, plus some extra administrative overhead. The national central banks have the balance sheets, and implement policy. Those supranational policies constrain what they can buy. You write ".........yet another wave of asset purchases by central banks" where-in I consider only the words "asset purchases by central banks". Exactly-where-from does a central bank get a supply of money that it can use to make asset purchases? Now I know that a central bank can create money, using only the paper and ink that becomes fiat money. This is a clear advantage that every central bank has over every other potential purchaser of assets, all other potential purchasers of assets having to source their money from prior earnings. At this point, my gambit towards a framework divides. The gambit has a mechanical component that follows a money supply that must increase if a central bank purchases assets. My gambit also has a psychological component that complains about one asset purchaser who prints value contesting with a second purchaser who must earn value. Maybe I am not seeking one framework, but two frameworks. One may be mechanical, the second framework psychological. If indeed two frameworks are involved, macroeconomic discussions need to commonly include both frameworks or risk serious departure from social relevance. Thanks for writing "The Calculus of Crisis". Your words make me think. The mechanics matter, but the underlying drivers are psychological. This can be seen using SFC models with investment, or the Kalecki profit equation. CB's buy those assets from market makers through the reserve system, using reserves which do not 'leak' to the non-financial sector (where most of humans operate in reality). It's a closed system. What it does in reality is make bad assets good by setting a price floor, stabilising the banks balance sheets which are subject to mark-to-market prices. That's all what the current CB policy is about, above everything else, as CB's don't (usually) leak new currency units to the non-financial system (they could, but they usually don't, in many cases the laws stop them from doing so even). It's only psychological if you frame the appetite for credit from non-financial sector as a psychological issue. Well, it's psychological like every choice humans make are rooted on psychological aspects. But if you ar elooking at some kind of absurd expectation-management central bank voodoo economics you are looking at the wrong place, as that's the last single thing the non-financial sector cares about when asking for credit, or the financial sector for actually lending (for this the first concern will be looking at balance sheet and flows of the potential debtor). "That does not mean that the euro must necessarily perish, one could imagine an intelligent redesign."